Singapore – Velocity @ Novena Square, a sports-themed retail mall in Singapore, has partnered with noisycrayons to launch a digital engagement campaign that aims to connect and deepen relationships with shoppers online. “Just Dunk It” by Velocity @ Novena Square instantly gratifies shoppers when they interact with the mall on social media. 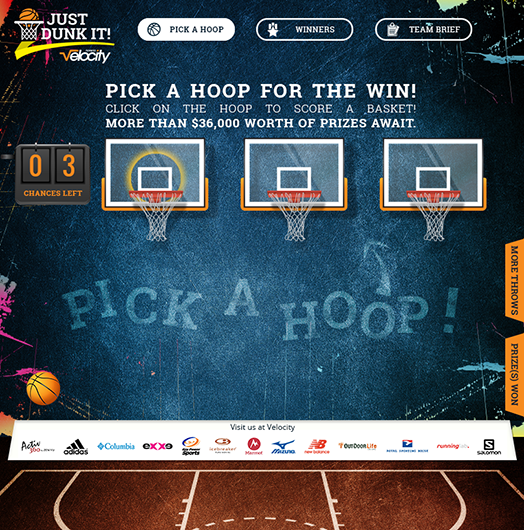 On a custom-built campaign application that is deployed on Facebook and mobile devices, shoppers take on the role of a basketball player to score a basket to uncover more than $36,000 worth of rewards that are only redeemable at the mall. The campaign recreates the thrill of the game and encourages shoppers to connect with the identity of the mall, as the go-to for sports and lifestyle needs. The 4-week campaign reached more than 80,000 active social media users between 18 and 35 years old. More than 2,000 shoppers were directed to the mall to redeem rewards during the campaign. Avast ye, me hearty! We go out to sea with the camera. The women don't get it. Social media campaign by celio* Singapore rewards men with shop-for-free spree.